This is one of those books for which the binding is key. Nita Leland’s Confident Color: An Artist’s Guide to Harmony, Contrast and Unity is published by venerable art instruction book publisher North Light Books. Like Leland’s previous book, The New Creative Artist (which I reviewed here) and Bert Dodson’s Keys to Drawing with Imagination (my review here), North Light has published it in their hybrid hardback/spiral binding, giving the overt clue that this is a book meant to be used, rather then simply read. 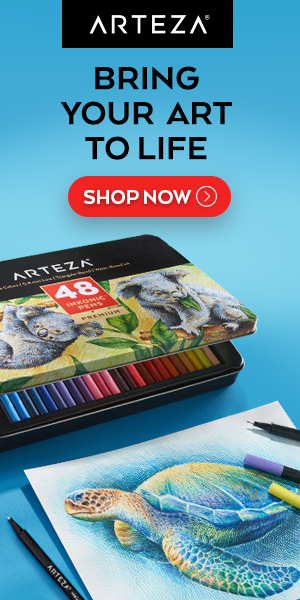 The spiral binding allows for laying the book flat on your drawing table, the hardcover allows for rough and continued handling, and the combination allows for propping the book open upright on the rail of an easel. The intention of the publisher clearly matches that of the writer, to get the most out of this book, it needs to be used, worked with over time; and will have shown its best service when ragged at the edges and spattered with paint. Not that you couldn’t settle into the Comfy Chair and find lots of interest to read through and look at; Leland drills through a concise introduction to color theory, history and terminology and covers the basics of understanding palettes and pigments, all augmented with her selections of works from a variety of contemporary working artists and a few of her own. The real value, though, is in the exercises, trials, procedures and processes that form the core of the book. If you’re lucky, you may have encountered a teacher like Leland in your formative years, one who will, however gently and politely, continue to poke and prod and push you to try something new, move out of your comfort zone, experiment, play and explore. This isn’t random try-whatever experimentation, however; in Confident Color Leland provides you with guided exploration, designed to systematically familiarize you with the ranges of relationships presented by your color choices. There is a “Look Inside” preview on the Amazon listing, though as is often the case, the pages represented don’t give the best indication of the actual content of the book. The index is actually better for that. The book is aimed at beginners as well as more advanced artists, and though watercolor is Leland’s medium and some of the pigments mentioned are particular to watercolor, the general palettes are set up with colors that work well across most mediums that involve color. 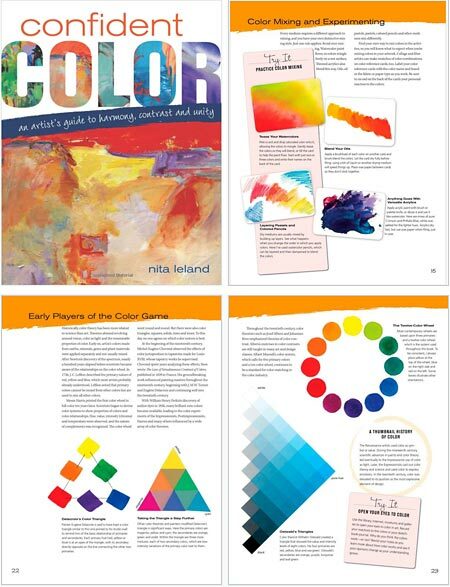 In some ways this is an extension of and companion to Leland’s 1998 book Exploring Color, which has become something of a standard among books on working with color. That book, though without the advantage of the lay-flat binding, was also meant to be worked with. Both volumes focus alternately on the split-primary process of color mixing and on the exploration of variations on the red/blue/yellow triads that serve as the basis for several of many possible color wheels. She urges you to work with and understand the difference between palettes composed of muted, intense and earth-toned colors, as well as the “workhorse” colors that form the basis of most artist’s palettes. In pursuing her exercises and explorations, you might work with colors and combinations that you would’t use in other circumstances, which may seem counter productive; but just as contour drawing is rarely used as the style for a finished work, knowing artists will work at it with dedication, letting the practice inform and strengthen their finished style. This isn’t the kind of book that says “mix two parts Cad Yellow to one part Ultramarine to paint this foliage”; in Confident Color, Leland is suggesting if you experiment with these excursions into color harmony and contrast, work through the mixtures possible with variations of of the primary triad and really get the feeling for how colors act and react with one another, you’ll instinctively know what to mix when you want to paint something. The book’s binding is the key. Confidence comes from doing. Thanks for your insightful review, Charley. I agree that the spiral binding and hardcover make a user-friendly studio book. You also clearly understood my purpose for the book–to encourage artists to practice and learn principles so they can think for themselves and not rely on recipes for color mixtures. Wonderful and accurate review of a beautiful book. I am so proud to be included and featured on the covers of the last two of Nita’s books. It should be a staple on the bookshelves for people interested in color, creativity and design in painting. I absolutely love this book, and learning to use a limited pallet has really helped me develop a better sense of color relationships. I have over a hundred books on art techniques, but this is one I refer to quite often.